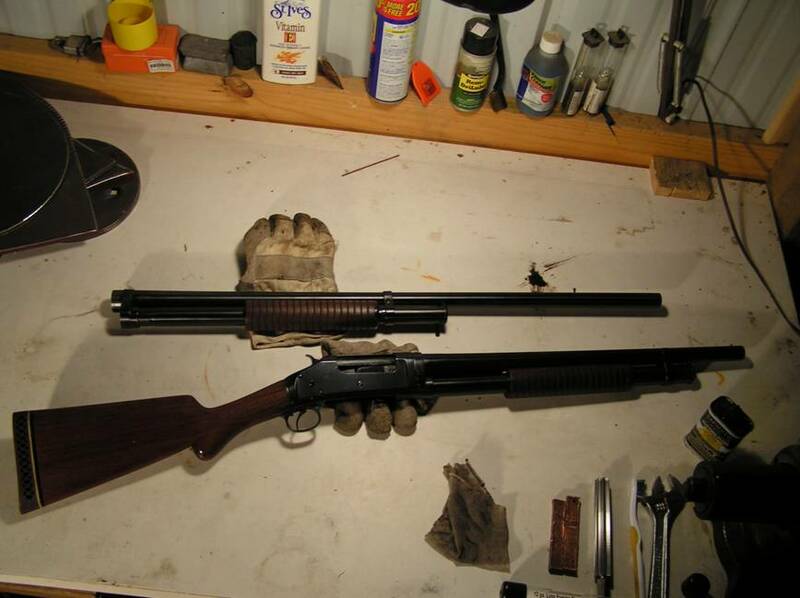 When I was a boy, my grandfather had a Winchester Model 97 shotgun that was my first introduction to “adult” shotguns. He may have bought it new in the early years of the 20th Century and had used it regularly on rabbits and pheasants in South Dakota. One day while cleaning it, I found his oil-soaked 1935 Pheasant License in the stock’s bolt hole. Needless to say, I wanted to have one of my own but they were out of production and a little pricey for my tight budget. Then in 1975, I found a usable "beater" M1897 on the gun store racks. It was $100 but my wife-person, Irish, said it could be my first wedding anniversary present. 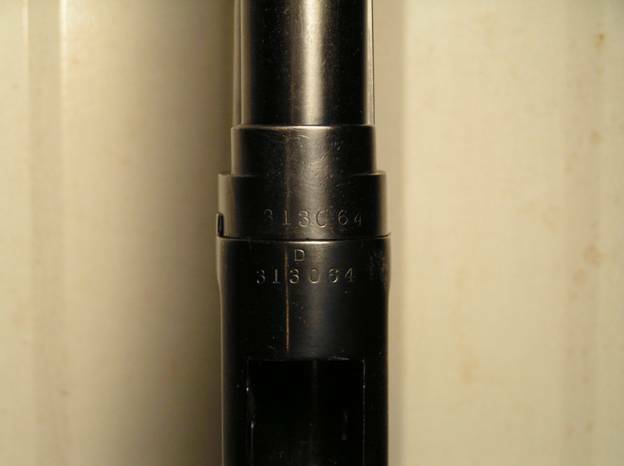 Some “bubba” gun mechanic had shortened the stock and screwed on a plain piece of leather for a buttplate and mended the barrel by soldering a replacement barrel piece on in place of the front 17” of the 1943-dated 30” barrel. The replacement barrel band was from some other model and didn’t stay put well. 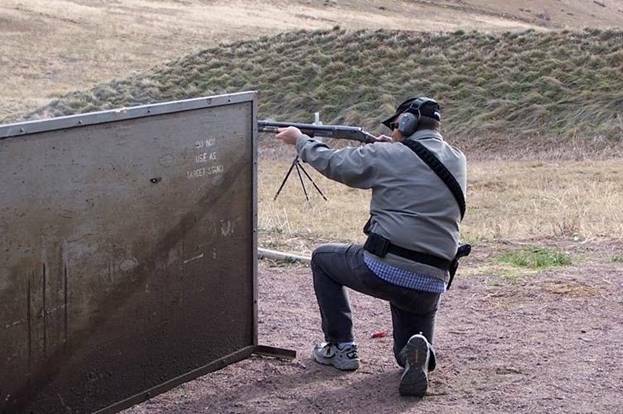 I determined that I would never waste my time and money restoring the gun and limited myself to bringing the stock back to full length with a recoil pad, fixing the cracked stock wrist, and shortening the barrel to 20”. So then the “fixit” bug bit me and I started tracking down replacement parts with the intention of a mild rebuild: just the barrel and front band. As the parts started coming in, I got one bright idea after another. I could put together a swappable set of front ends for Practical Shotgun and field shooting. 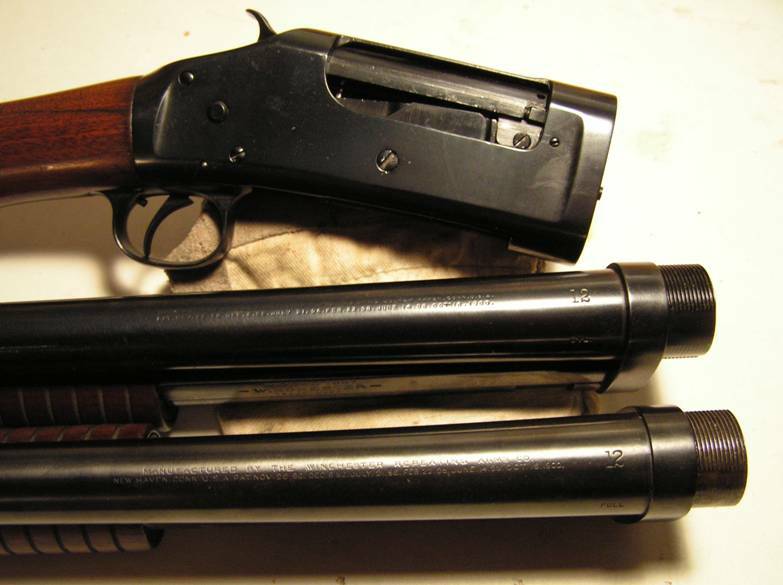 I could use vintage barrels that (sort of) matched the 1905 receiver. I could have the parts refinished to bring all the different patinas to one consistent black oxide finish. I could have the chambers lengthened and the barrels back-bored to clean up years of neglect. 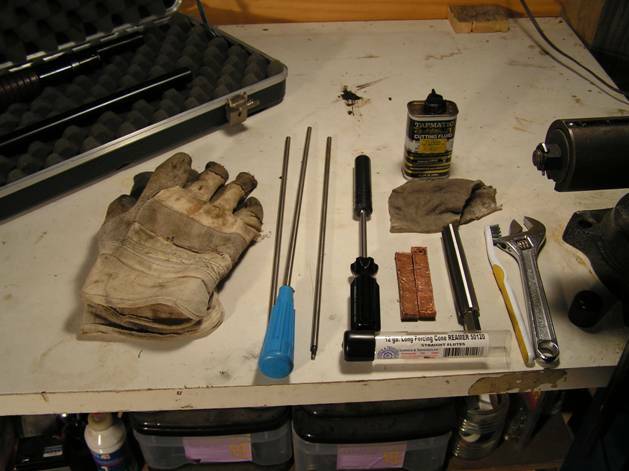 So I took my assemblage of parts down to the local trade school and laid out what I wanted. They cut one barrel to 19.5” (I had asked for 18”) and mounted the steel beads I supplied to the vintage spacing of 1/2” behind the muzzle. They gave all the parts a decently-done coat of black oxide. Then the project hit the liability snag. The owners of the school forbid the student smiths from making a vintage shotgun shootable lest I hurt myself and sue them. 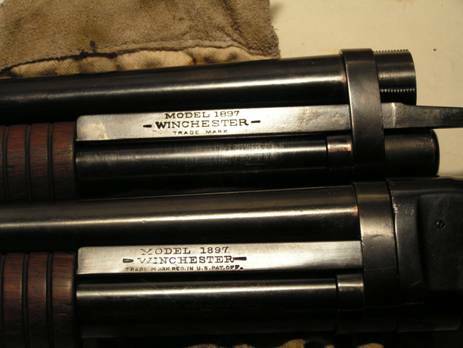 They left the chambers short (for obsolete 2 1/2" shells), refused to back bore the barrels, and didn’t shorten the shank on the 30" barrel so that it would draw up tight to the receiver (it swung like a licorice whip on the front of the receiver). So what’s a gun crank to do? 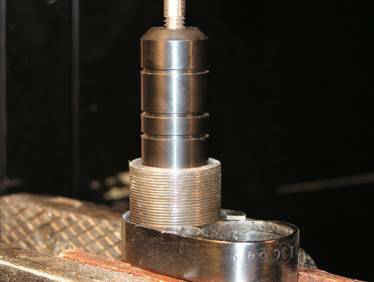 I filed the shank down until the 30" barrel would draw up nice and tight on the receiver and ordered a long forcing cone reamer from Brownell’s and lengthened the chambers myself for 2 3/4" shells. So now I have a usable shotgun with swappable front end sets suitable for Cowboy Action and busting a few clays or even hunting (the full choke 30" set's magazine is blocked to hold the hunting legal maximum of two rounds and the cylinder choke 20" set holds six). Back boring the rough interiors is the next conundrum to resolve (get the tools or take them to a different gunsmith or just live with it). So why do I call this the “Pointless Project?” Because I have now spent enough money to have just bought two M1897’s with each having the barrel length for its intended role. 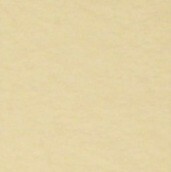 And I’m not quite through yet. 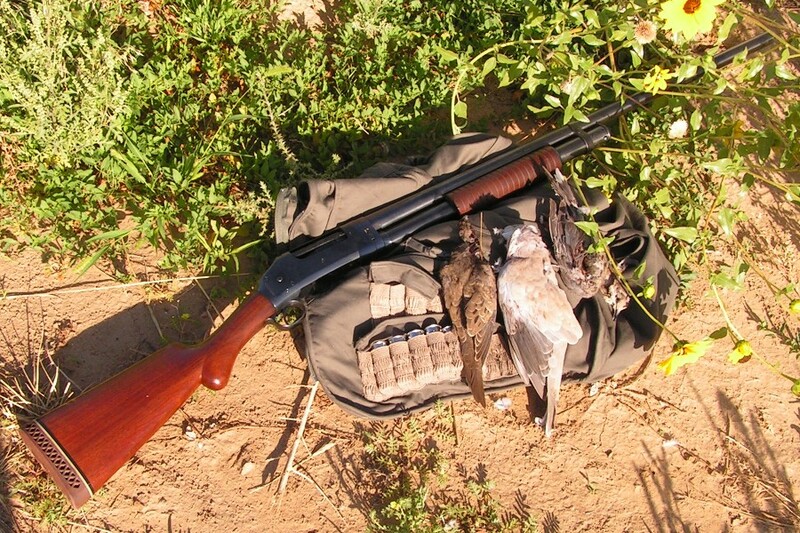 But then this was a labor of love and nostalgia (and too much choke for dove hunting).